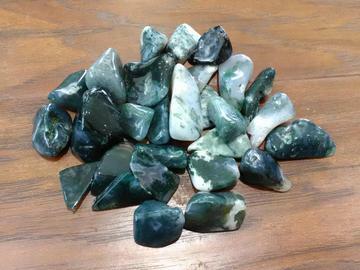 Moss agate is a form of silicon dioxide. It is chalcedony which includes minerals of a green colour embedded in the stone, forming filaments and other patterns suggestive of moss. It is white with green inclusions that resemble moss. Moss Agate reduces sensitivity to weather and environmental pollutants. It attracts wealth and improves self-esteem. Stone sizes range from 3/4" - 1"